Jon and I have gone back and forth over which is the worst Star Trek movie ever. Depending on my mood, I argue for Star Trek: The Motion Picture (the first one) or Star Trek: Nemesis (the last one). But we all agree Star Trek V (the middle one) was an absolute mess. How much of a mess? Well, you can listen to the first ever Play Cole pod cast and see for yourself. It's our Audio Commentary of Director William Shatner's Audio Commentary on the Star Trek V DVD. Listen to it on it's own, or while watching Shatner struggle to explain this mess on your own TV. This podcast also introduces new Friend of Play Cole Mike Drucker to the family. Look for more audio commentaries of audio commentaries in the weeks to come. Like the other great determiner of American culture, St. Louis has a Hollywood style walk of fame focusing on local celebrities who have a national impact. Of course, the St. Louis Walk of Fame isn't actually in St. Louis. It's in a suburb called University City. Which is different from Universal City outside Hollywood. I know what your thinking. "Wow, Cromely, that's really cool. I wish I could be part of the walk of fame, but, sadly, I wan't born in St. Louis. Or Universal City. I guess I'm out of luck." So there is hope for you, too. 1) They must have been born in St. Louis or spent their formative or creative years here. 2) Their accomplishments must have had a national impact on our cultural heritage. The selection committee is 51% female and 49% male; it is 71% white, 27% African-American, and 2% Asian-American. For more shots of the walk of fame, visit my Flickr Site. In Jennifer Government, Max Barry crafts a dystopian future where capitalism has run amuck. A person’s last name is the same as their employer or school. The federal government is little more than a contract enforcement body. Corporations and people have full reign to do pretty much anything they can pay for. The government will only investigate crime when the victim can afford to fund the prosecution. And (supposedly) the language in a contract beats all. The story opens when low level marketing employee Hack Nike finds himself promoted after a chance meeting. He signs his new contract without reading it, and only then learns what his new job will entail. To increase sales of a line of sneakers, he needs to kill 10 kids who buy them. People will think the sneakers are so popular, that kids are killing each other to get their hands on a pair. Nike would then flood the market with the now coolest product on the street at a huge price, and make a different sort of killing. Hack, though, is not entirely on board with this plan. He shook his head angrily. What was he thinking? He wasn’t going to shoot anyone. Not even for a better apartment. But he signed a contract. His freelance and last-name-less girlfriend Violet encourages him to go to the police. He does, and they explain his options. If Hack Nike goes forward with the killing, the police will find him quickly, and if the families of the victims choose to fund it, he will be prosecuted and sent to prison. Or, he can outsource the job to the Police and they will take care of it. For a fee of course. Hack signs another contract without reading it. Things start happening quickly from there. Barry introduces us to Jennifer Government. Jennifer is a Government agent with a mysterious past and an even stranger tattoo. She is the classic cop who plays by her own rules, and who drags her more relaxed but supportive partner into the mess. She is more concerned about doing what’s right than doing what she’s supposed to do. Barry does a nice job of setting up a complex plot with lots of twists and turns. The story quickly takes off and involves the highest level executives in the world, government structure, and lowly laid-off take builder Bill formerly-Betchell. Billy Betchel built tanks. Big ones. They had caterpillar treads and cannons on the front and swiveling machine guns; they were …impressive, was what they were. When anyone asked what Billy did for a living, he said, ‘You know the Bechtel military yards, outside Abilene? I work there,’ and watched their eyebrows jump. It got so Billy started wishing his job was as cool as it sounded. The independent person who doesn’t realize the deck is stacked against them until it’s too late. Barry takes these characters and puts them in new situations that explore the extremes of libertarianism and unbridled capitalism. He attacks the extremes of free markets without saying anything bad about them. Instead he puts the story in play to see what can happen when anything goes. The pacing of the story is a bit uneven. It starts off at a decent pace. Then it plods a little. Then it sprints. Then it plods some more. Then it sprints again. While there may be pacing issues and some shallow character development, Jennifer Government is definitely worth reading. The story is complex and interesting. And the action sequences are tight. One of Barry’s strengths is the action sequences. Many authors have trouble with these. They put a lot of characters in a scene and when the bullets start flying, it all becomes mud. That doesn’t happen in Jennifer Government. Barry manages the locations, activities, and motivations of his characters well even when things get crazy. This is especially difficult since he tells the stories from inside the characters' heads and tries to hold on to their voices. But Barry deftly manages the locations and actions of multiple characters when they are quickly colliding. Some of my favorite phrases in the book are those that give us some insight into the characters. John Nike is an executive with Nike on the rise. He represents the ultimate free marketer and for Barry, represents the voice of the era. The easier your job, the more you got paid. John had suspected this for many years, but here was proof: pulling down five hundred bucks an hour to sit in the afternoon sun on top of an L.A. office tower. He was wearing a brown suit and shades, reclining on a deck chair while a light breeze blew in from the bay. John thought he might have found the perfect job. Violet, on the other hand, is the entrepreneur trying to be John Nike, but from the bottom of the economic ladder. She took her fingers out of her mouth and looked at them. The nails were broken and ragged. There was blood and torn skin under them. She leaned over and spat, but the taste wouldn’t get out of her mouth. She didn’t know whey that courier girl had put up such a fight. Violet had only wanted her stupid jacket. People always had to make things difficult for Violet. They always had to screw her over. Jennifer is the cynic and remains highly skeptical of the world around her. He smiled, but it was a strange, disconnected smile; it worried Jennifer a little. Buy Matsui was not running on all cylinders. Companies claimed to be highly responsive, Jennifer thought, but you only had to chase a screaming man through their offices to realize it wasn’t true. Hack Nike is really the only character who has a major personal epiphany. There are others who almost do, but Barry chooses not to explore those moments with other characters. Still he felt upbeat on the cab trip back to Claire’s. He felt like he’d discovered something important. People like John Nike hadn’t been pushing him around for no reason, Hack realized: he had let them do it. He’d expected them to do it. Well, all that was going to change. He was going to take control. If you find yourself reading the book and getting a little bored, just keep reading. It will pick up again. And the story is worth it. 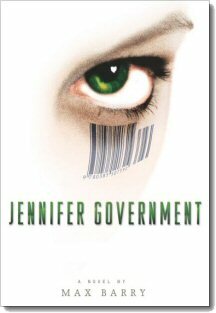 If you want an entertaining story, told with a sense of humor, about a dystopian future, pick up a copy of Jennifer Government. Don’t expect a deep character sketch, and you will likely enjoy it. The Cylons already found Earth. They were here decades ago -- as early as 1939. Of course, like all computers, they were much bigger then. And they weren't quite as mobile as they are now. ...It's easier to go after the people who point out just how much of a charade TSA is. On Friday, Congress heard Soghoian's message loud and clear. But instead of promising to reform broken airport security procedures, Rep. Edward Markey (D- Massachusetts), a member of the House Homeland Security committee known for his defenses of privacy, wants the site shut down and Soghoian arrested. "The Bush administration must immediately act to investigate, apprehend those responsible, shut down the website, and warn airlines and aviation security officials to be on the look-out for fraudsters or terrorists trying to use fake boarding passes in an attempt to cheat their way through security and onto a plane," Markey said in a statement Friday. This angers me for several reasons. First, Markey acknowledges that we are not checking ANY air cargo. I can't take my 6 ounce tube of tooth paste on the plane, because someone might break the laws of physics and chemistry turn it bomb, but anyone could ship 100 pounds of explosives in the cargo hold of a loaded passenger plane. Of course the reason is that it would cost the shippers money, and more importantly, the voters don't SEE the scanning. The advantage of TSA, is that the voters see Congress spending money on "security" and think their reps are doing something. Second, anyone with rudimentary knowledge of HTML can edit or create a boarding pass that will get anyone past the ID checker. This is not a revolutionary or complicated hack at all. Third, so what if someone can fake a boarding pass for the ID checker. And it doesn't matter because they still aren't getting on a plane with it. At the door, gate agent will just scan the barcode and catch the fake. Or they'll catch it when the scanned "boarding pass" doesn't match what's in the system. And if the gate agent doesn't catch the fake, the passenger who has that ACTUAL seat assignment will catch it. Fourth, again, so what? If TSA is competent, they are screening the passengers anyway. Even if someone has a fake boarding pass, their luggage is being X-Ray'ed, they are being screened through the metal detector, and their mouth wash is being taken away. Fifth, historically, why would a terrorist fake a boarding pass? Expedia is not that hard to use -- they'll just buy the damn ticket. There's not point in faking it. Sixth, it's outrageous that Markey is calling for the arrest of this guy. The idea that we should prosecute him for pointing out there is a problem, rather than trying to fix the problem is one more demonstration that TSA is more of a fancy PR move than an actual enhancement to security. And, now, for saying this, Rep. Markey will probably call for my arrest. At least I have a guarantee that my right to Habeas Corpus will be protected. This is why a town benefits from having different media options. This is the same story as published by Seattle's two different newspapers. As it announced strong quarterly earnings Wednesday, Boeing also projected large increases in spending this year and next on development of the new 787 and on the forthcoming 747-8 jumbo-jet derivative. The boost in research-and-development spending — the second in as many quarters — raised the R&D budget to almost a billion dollars more than forecast just five months ago. The additional money for next year includes funding to pay extra mechanics in Everett, if needed. Yet with revenue and profit for the quarter strong, executives seemed confident Boeing can absorb that extra spending. They still raised 2007 profit forecasts and tried to dispel any suggestion the bump in 787 costs meant the program is running into the kind of trouble afflicting Airbus. The Boeing Co. threw a scare into Wall Street on Wednesday when it announced it was pouring hundreds of millions of dollars more into the development of its hot-selling 787 jetliner to head off problems that could otherwise threaten the project. With the first flight less than a year away, the Dreamliner is still too heavy. And some suppliers are falling behind schedule. Boeing said it has funded a contingency plan to hire more machinists to help with 787 final assembly at the Everett plant should they be needed to keep the program on track. The additional jobs -- Boeing wouldn't say how many -- would be temporary. Boeing Chief Executive Jim McNerney, in a conference call to discuss third-quarter earnings Wednesday, reassured analysts several times that he believes the 787 issues will be resolved and will not delay the plane's entry into service in May 2008. ...Here is the Balrog chewing on an Ewok and a GI Joe character. Breaking ground on the Second Avenue subway - a dream for generations - is just months away, transit officials said yesterday. The Metropolitan Transportation Authority hopes to award a contract to build a new tunnel for the East Side subway line by year's end, Mysore Nagaraja, president of the MTA's Capital Construction Co., said. A few weeks ago, I wrote about the best new show of the Season -- Studio 60 on the Sunset Strip. The episodes that followed the premiere haven't been quite as good, but that's to be expected. They have, however, been excellent. Of course, I don't watch live TV. TiVo changed my life. But Studio 60 is on opposite one of the CSIs or something so TiVo doesn't record it. But I still haven't missed an episode because NBC gets it. This year, they have a site called Rewind. Here you can watch 2 minute clips of most programs, or in the case of Studio 60 and other select shows, you can watch the previous week's episode in its entirety. After Studio 60 airs, I go here within the next week and watch it on line through streaming video. As long as I have a broadband connection, I can keep up with my favorite shows. NBC lets me watch the programs when I want. But they're not just doing this for my convenience. They break each show into segments that align with the commercial breaks for the on air version. Before each segment begins, I have to watch a 30 second commercial that I cannot fast forward through. I've watched a bunch of ads for the Toyota Tacoma pickup truck. In past weeks, the sponsor was AT&T. Think back to the last live TV program you watched. Who was the primary sponsor? Can you remember the primary sponsor from several weeks back? With Studio 60 and NBC.com, I can. As we've seen with The Apprentice, networks are trying to find creative ways to get ads to the TiVo generation. In Donald Trump's show, it by making the game about the advertised product. On Rewind, NBC takes a more traditional approach. They show one commercial before each segment, and there is a static ad next to the video window. So we have a win-win-win situation here. I'm watching the program when I want to. NBC is showing me the commercial. And after the video, since it wasn't drowned out by competing ads, I remember Toyota's ad. It was, indeed, a very good year. The first 10 seconds is pricesless. I sure hope some illicit substances were involved with this. He out-Shatners Shatner. Was North Korea's bomb a dud? The apparent low yield of the North's test could signal that its scientists, working largely in isolation, haven't quite perfected the deadly art of efficiently splitting atoms. Armageddon's not as easy as it looks. More than 60 years after the United States first tested a plutonium weapon Â partly because scientists weren't sure that it would work Â the technology is still tricky for novices to master. "The devil is in the details," French nuclear proliferation expert Bruno Tertrais said. "It's like cooking. The fact that you have the recipe does not make you a chef." "And today's secret ingredient is...PLUTONIUM!!!" But there's also a possibility that the device Â if it was indeed nuclear Â suffered what experts call "a fizzle," when the fissile material that provides the bang, likely plutonium in North Korea's case, detonates only partly. That's the technical term for you home gamers. "The working assumption is that more likely than not it was a nuclear bomb, although not a successful one," said one U.S. official, who requested anonymity because the matter is highly classified. That's the problem with socialist societies. Even the bombs are under achievers. The apparent low intensity of the explosion was a key reason for suspicions that it was a dud or, at best, only partially successful. France's atomic energy agency did not want to comment further today Â partly, a spokeswoman said, because it was concerned that discussing where North Korea might have gone wrong could help it fix any problems for next time. Though they did surrender after the interview. The apparent low yield, he added, "indicates that the North Koreans really have trouble making what ordinary people would call a nuclear bomb, they really have a primitive nuclear device." This sort of behavior reinforces why I bought the stock. Because the CEO and CFO benefitted from some poor record keeping -- not fraud, but just not detailed enough -- they are voluntarily forgoing bonuses. Sure, it's just a rounding error in their larger finanacial lives, but how many CxOs will do this? Costco Wholesale Corp. Chief Executive Jim Sinegal and Chief Financial Officer Richard Galanti are voluntarily forfeiting their annual bonuses after the company disclosed last week that they benefited from sloppy record-keeping on prior stock-option practices. Sinegal is giving up $200,000, while Galanti is rejecting an $82,000 bonus, according to a Securities and Exchange Commission filing made public Thursday. ... you leave your Seattle apartment for an event in Tacoma 35 miles away -- and you take your passport. While walking from the Marriott Marquis in Times Square to the Javits Convention Center, we pass a few theaters. Outside of one, we enocunters a woman who seemed to be in her 70s, and seemed to have been smoking for the past 85 years. As we passed her, we learned she was a scalper. Now, this raises a few questions. Are Martin Short matinees really selling out? Is this the new Social Security program? If someone else tries scalping tickets on 44 ST, is she going to beat them up? We had a great dinner tonight at a place called Zanzibar on 9 AVE. It's a Mediterranean Tapas Bar on 9 AVE and 45 ST.
Photo by eqqman -- available on flickr. Half is a club, and half is a restaurant. It is filled with the requisite "pretty people" but doesn't have a stuffy or uncomfortable atmosphere. They seated us right away on booth benches at knee height coffee tables. Everything we had was good, but if you go, I highly recommend the humus and the lamb chops. Oh, by the way, like any good Mediterranean restaurant, they had Guinness on tap. I saw Jon perform at The World tonight, along with a slate of very funny people. It was an awsome show. Go see it if you're in NYC. Here's his schedule for the month. Jon, Ed, Mike, Lara, Shannon, Alex, and the rest of the crew put on a heck of a show. This is another link I originally saw on Fark.com. It answers talks about what will happend to the earth if humans suddenly vanished. The boy, who suffered a fractured skull, was in serious but stable condition Monday at Children's Hospital in Pittsburgh, police said. Earlier this year, we learned that unrestrained children can become missiles. Now babies are the weapon of choice in assaults. Obviously, we need to take action. At the national level, we need to encourage the Bush administration to push for the signing of the Baby Non-Proliferation Treaty. The BNPT will help protect us against the humanitarian crisis that's sure to erupt once North Korea starts flinging infants across the Pacific. The TSA must start confiscating babies at the airport security checkpoint. They are too dangerous. We don't allow other missiles on our airplanes, why should we make an exception for babies? If you don't agree with this critical security measure, I have to ask, why do you hate America? People in the inner cities who have been victims of baby-violence need to band together and demand their political leaders sue the makers of cheap out of state babies that are flooding our streets. How can children get an education and lift themselves out of poverty when they are too afraid of baby-violence to go to school? Drug dealers have to protect their stash and they are relying on baby missiles and clubs more and more each day. If your children are playing at a friend's place, find out if their parents have a baby in the house. Baby accidents are the leading cause of death among kids today. So, think of your home. And most of all, think of America. I found this on Fark. CANBERRA (Reuters) - As Australia braces for a scorching summer wildfire season, firefighters are being forced to spy on their own ranks amid suspicions one-in-five bushfires are lit by firefighters. On the other hand, corporate recruiters often value candidate who demonstrate initiative. But state bushfire chief Phil Koperberg said commanders were watching up to 30 suspects for certain telltale signs. "You are not supposed to like going out firefighting," Koperberg told Australian newspapers. True enough. How many employers will actually tell you that your are not supposed to like your job? The Starbucks (SBUX) corporate headquarters is a gorgeous building. They renovated the building and gave it a new facade after the 2001-02-28 Nisqually Earthquake did some major damage. And, yes, there is a Starbucks in Starbucks. You know, I would watch this show every week if it aired here. You can see more clips here. In the description box to the right of the window, click "More". You'll see links to a bunch more clips. They even have some with middle aged guys doing the exercises instead of the women. I don't recomend that. Making a Phone Call in a Foreign Langauge is "suspiscious"
Sadly, these stories are fairly common any more. A 32-year-old man speaking Tamil and some English about a sporting rivalry was questioned at Sea-Tac Airport and missed his flight Saturday because at least one person thought he was suspicious. Parker said the man was cooperative and boarded a later flight to Texas. He told officials that he would not speak in a foreign language on his cell phone at an airport in the future. This weekend, I noticed the camera tripod in the back seat of my car. I’ve seen it there almost every time I’ve gotten out of the car for the past few months. I last used it when I shot the video of Trish and Andy’s wedding in June. Why is it still in my car 3 months later? Inertia, identified by Sir Isaac Newton, is physical principle that says objects at rest will stay and rest and objects in motion will stay in motion unless acted upon by an external force. A lot of things in my life are like that. I fall into a routine, and inertia keeps me in that routine. Without a reason to break the routine, why would I? I’m not a big fan of change, although usually the most disruptive events in my life are also the most positive ones. I’ve been thinking a lot about 1989 to 1995 -- the years I lived in Helena. I graduated from Carroll College in 1993, and really had no major desire to leave the area. I had friends there. It was inexpensive. And Western Montana is the most beautiful place on the planet. But I wasn’t growing anymore. My career wasn’t moving forward. I knew at some point I would have to leave the $250/month house I was renting and try something new. But the inertia kept me there. Until one night in March of 1995. I traveled with my debates team to the Oregon to judge some competitions. On the drive back, I was one of 5 or 6 people in a 15 passenger van. We were pulling a U haul trailer filled with luggage and debate supplies. I drove from Eugene, OR to a rest stop between Ritzville, WA and Spokane, WA. Another driver took over at that point, and I sprawled out on one of the bench seats to get some sleep. I woke up several hours later, feeling unusual and awkward G Forces. I though we were taking an off ramp too quickly. Then we stopped and an odd angle. I popped my head up to the driver asking everyone if they were okay. I look out the Window and saw the hill side closer to the window than I expected, and the interstate facing the wrong way. There was no off ramp. Apparently, we hit a patch of black ice and started fishtailing. The trailer and back end of the van whipped around front, and we went off the road. I don’t know how many times we swung around, or if we did just a 180 or 540 on our way off the road. But we came to a stop in the ditch off the shoulder of Interstate 90 about 20 miles west of Kellogg, ID in the middle of the night, with a flat tire. Some of the passengers were shaken, but no one was hurt. We crawled out of the van and began slipping all over the black ice covering the shoulder and the road way, and we contemplated our next step in the chilly mountain air. A logging truck rumbled over and stopped. It towed us out of the ditch as though the van were made by Nerf instead of Ford. Seeing the truck pull the van out and lifting it 5 feet off the ground like it was nothing is one of the most impressive things I’ve ever seen. Eventually we called a tow truck after several futile and shoulder aching hours trying to change the tire. I caught a ride to town in the tow truck. About a quarter mile down the road we rounded a bend, and instead of the hillside the van spun into, the road dropped off into a valley. Had we gone off the road here the van would have rolled. Probably several times. None of us were belted in and likely would have been ejected in a crash. Several of us would have been severely injured or worse. By just a quarter mile. And that thought stuck with me for days. I had previously promised myself I wasn’t going to die in Montana, but I realized then that declaration didn’t include North Idaho. A week later, I turned in my resignation at Blue Cross and Blue Shield and began the job hunt and bi-weekly trips to Idaho that would eventually lead to my new life in Boise. I hated to leave Helena. In fact I was angry as I drove the moving van out of town several months later. But it was time to go. And all it took was a van crash on a lonely, icy interstate for me to see that. Today, I got out the car in my Seattle garage. And I paused at the back door. I looked at the tripod sitting on the floor of the back seat. I opened the door, picked it up, and looked at it for a few moments, thinking about life in Helena. I laid the tripod across my shoulder and headed up to my apartment. I've been reading this thread on Flyertalk since if first popped up. Ryan Bird, the passenger detained reports his story in the first post of the thread. Now it's on CNN, too. A Frequent Flyer wrote "Kip Hawley [TSA Head] is an idiot" on his clear baggies that contained his toiletries. Because this form of political speech is apparently they same as making a joke about a bomb or an imminent act or terrorism, TSA and the sheriff's department detained him. WASHINGTON (CNN) -- A Wisconsin man who wrote "Kip Hawley is an Idiot" on a plastic bag containing toiletries said he was detained at an airport security checkpoint for about 25 minutes before authorities concluded the statement was not a threat. Ryan Bird, 31, said he wrote the comment about Hawley -- head of the Transportation Security Administration -- as a political statement. He said he feels the TSA is imposing unreasonable rules on passengers while ignoring bigger threats. Given the stupidity and pointlessness of the current liquids/gels ban, this statement really is nothing more than saying the Emperor Has No Clothes. But that kind of dissent isn't really being tolerated by TSA anymore. "So who came up with the idea that a bomb could be made on board? Not Al Qaeda for sure. It would not work. Bin Laden is interested in success not deterrence by failure," Wylde stated. "This story has been blown out of all proportion. The liquids would need to be carefully distilled at freezing temperatures to extract the required chemicals, which are very difficult to obtain in the purities needed." Once the fluids have been extracted, the process of mixing them produces significant amounts of heat and vile fumes. "The resulting liquid then needs some hours at room temperature for the white crystals that are the explosive to develop." The whole process, which can take between 12 and 36 hours, is "very dangerous, even in a lab, and can lead to premature detonation," said Lt. Col. Wylde. Yeah. No one's going to notice if you try that in an airplane bathroom. So rather than addressing the underprotected chemical plants in the country, the nation's major shipping ports, or even commercial air cargo, DHS has decided I can't take shampoo on the plane because somehow it might be used in an impossible plan. Good work, guys. That right there is tax payer money well spent. I originally saw this on fazed.net and fark.com. since then, It has also been featured on Web Junk 2.0, The Soup, and probably a few others. If you havne't seen it, you're probably not wasting enough time on line. These videos seem to feature all the English you need to know to visit New York. There are two versions here. Be warned: you will get this song stuck in your head.